Stopping hunger is about more than food. Last year, foodbanks in The Trussell Trust Foodbank Network not only gave out almost 1.2 million parcels of food, but worked hard to address the underlying causes of hunger so people would be less likely to need their help in the future. Foodbank volunteers are trained to provide a listening ear and put people in touch with other local agencies and organisations that can help. Over 90 percent of foodbanks now also provide additional services onsite, including housing, debt and welfare support; services like holiday clubs and budget cookery courses; and additional items such as clothing and toiletries. It is clear this additional support is crucial. Research by think tanks, NGOs and academics have highlighted how household budgets are being stretched further to accommodate rising costs of basic essentials, with increasing numbers of people struggling on low incomes and experiencing destitution in the UK. The University of Oxford’s recent research with foodbanks in The Trussell Trust’s network found that people at foodbanks experience multiple forms of destitution: in the twelve months before visiting a foodbank, 50 percent of people couldn’t afford heating or toiletries and 1 in 5 had slept rough. 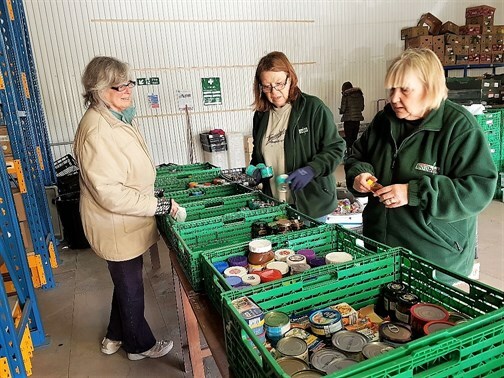 With the situation showing little sign of improving, Stansted Airport and surrounding foodbanks began to pool resources to help address the need for essential items locally, while reducing the huge amount of essential items being wasted at Stansted airport. Since September 2016 foodbanks in Harlow, Uttlesford, Braintree, and Hertford have been carrying out a joint pilot project with Stansted Airport’s environment standards team to help them recycle passengers’ surrendered/restricted non-perishable food, drink and toiletry items when undergoing hand baggage checks. Passengers whilst frustrated at having goods confiscated are pleased they are being put to good use. Harlow Foodbank takes in the bulk of deliveries from Stansted as they have a 5,000 square feet Store House. Redistributed items typically include: tinned beans, soups, meat and fish, spreads like marmite and peanut butter, jarred pickles, top range jams and marmalades from Buckingham Palace, Fortnum and Mason, Highgrove and Harrods, as well as a large range of toiletries, soaps and gift sets. All donated items are checked for quality and then distributed to local front-line agencies, charities, schools and other local organisations. Feeding Britain, the charity started by the All-Party Parliamentary Group on Hunger, included in its report a recommendation that airports make ‘contact with its local food bank to offer them unopened non-alcoholic drinks, non-perishable food, toothpaste, shower gels and other hygiene products that are surrendered during security checks. Such supplies will play a crucial role in alleviating at least some of the pressure on household budgets when individuals and families cannot afford to buy food’. Due to the success of this initial pilot project, the foodbanks will be continuing with this partnership for the foreseeable future and are keen to share their experience with other foodbanks and airports who might be interested in undertaking a similar initiative. If you are interested in learning more about this partnership or would like support in setting up something similar in your community please contact Feeding Britain.